Gremlins, Inc. is a computerized board game designed by Alexey Bokulev and Sergei Klimov produced under the Charlie Oscar Lima Tango Interactive Entertainment brand. It was published in 2016 by The Merchant Guild of Rund to the Steam platform. It appears to be fully multiplayer, where players may play online competitively individually or in cooperative teams, or locally competitively individually or on teams as well. It appears the game may be played by 2 to 5 players. There are ladders that track player statistics that may be climbed. There appear to be plentiful mods to customize, enhance, and extend the base game, and the game appears to have been consistently updated since its release. Players may play as one of five classes of character: the Explorer, the Manager, the Gambler, the Collector, the Thief, or the Damned. I am not yet certain as to the strengths or weaknesses of the various classes since I’ve only ever chosen the random character option. Hovering over each one should give a description of their strengths and weaknesses. Players are dealt six cards each at the beginning of the game. As these cards are played or otherwise discarded throughout the game, they are replenished immediately from a random deck. At the beginning of the game, all players may discard as many cards as they wish from their hand to be redrawn prior to playing their first turn. Each card has a name and unique game art that make them easily remembered and identifiable at a glance once you get used to playing. 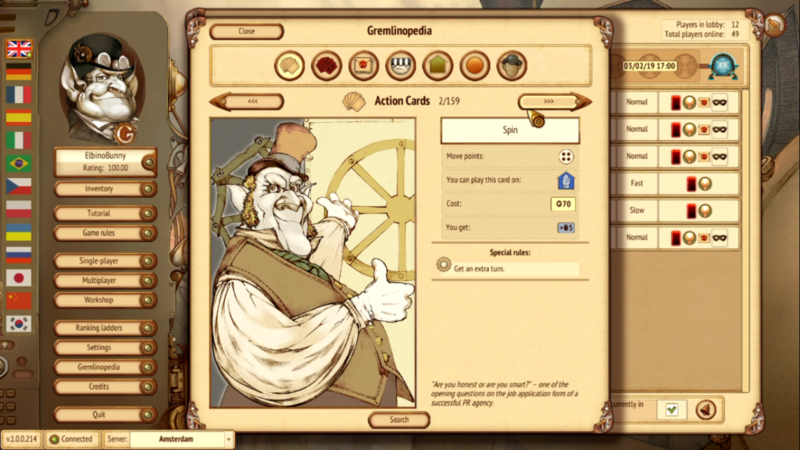 The Gremlinopedia contains an index of each card and what effects they have to be referenced by the player when needed. All of this information is also present on the cards themselves within a players hand. The number in the upper left hand corner of the card is the movement number. Cards may be played to move around the board or they may be played to execute the card’s action, but never both. Once a card is played for movement or its action, it is discarded. When played for the card’s action, the card must be played on the spot that it corresponds to. A picture of this spot is located on the bottom left of the card. A description of all of the spots on the board is included below. Some cards have an added action effect when played. These cards will have a gear icon located at the upper center of the card. Hovering the mouse pointer on this icon will reveal text that explains the card’s effect when played. The Gremlinopedia for referencing card effects and game information. There are numerous Gremlins, Inc. game boards to play on, and none of them that I have seen are fully linear. Be careful to check the arrows on the board to plan your movement. On the board I first played on, there was a primary loop to travel counter-clockwise around in a circle that was fairly low risk. This primary loop had loops to the unique game spots connected to it, so traveling around this loop would provide a player access to those spots. However, there are also places within the primary loop where the player may take short cuts or move to a different place in the loop entirely. The player must take into account the risk versus reward when choosing their particular path. Paths with high reward usually come with high risk, while paths with lower reward come with a lower risk. The most important and precious resource in the game are the general game points. At the beginning of each game, the game host decides how many game points will be played to. In the game I played, the number of game points was 20. This means that the first player to reach 20 game points would win the game. The number of game points a player has is shown in the middle of a green gear next to their player portrait on the main game screen. Wherever game points may be added or subtracted from the player in a game, they are represented by a gear. Discard and redraw any number of cards prior to first turn. There are also votes that may be collected or lost while navigating the board. Whomever has the most votes when elections are called becomes the governor. It’s good to be the governor. Governors don’t have to pay any resources when landing on a bribe spot. Pitchforks are another resource. The more pitchforks you have the more notorious your reputation which counts for something. Be careful that you don’t have the most pitchforks though as some of the nastier misfortunes target the most evil player in the game. Then there is the + and – resources. The – resource is used to pay off the police when landing on a police spot and pay bribes. Money, or G, is the common currency of the game. Many cards require G to play on their respective spots. 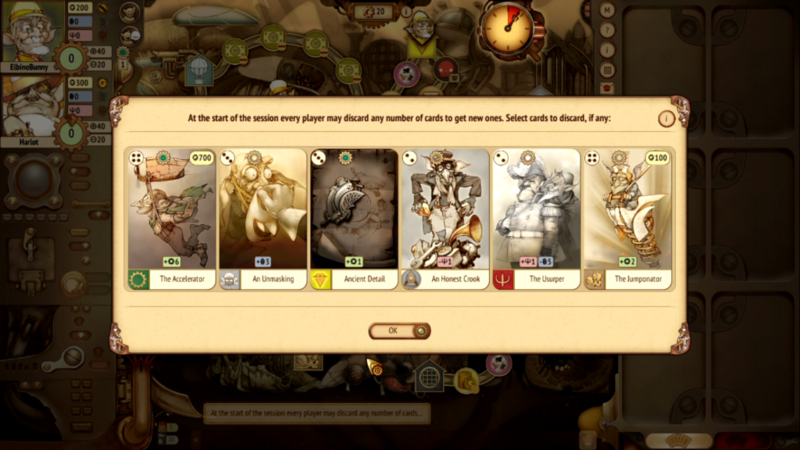 When G is required to play a card, the amount required will be shown in the upper right hand corner of the card. The more powerful the card, the more costly it is to play. Unfortunately for the player who likes to plan ahead, G is what is most often increased or decreased in all of the in game events around the board which makes the amount of it in your purse at any time highly volatile. Getting a high power card that requires around 1000G to play made my mouth water since it would pretty much settle the game if I were to successfully play it. So I would plan out how to get to the other side of the map to play that one card and save enough G on my way there to spend it solely on that card. I tried three separate cards like this in the game I played and each time there was something that made me lose enough of my money to keep me from playing each of those three cards. This was even with me being the governor for around 80 percent of the game. The fluctuation of G in my coffer was a strong signal that Gremlins, Inc. is as much a game of chance as it is a game of skill. Randomness is hidden by the complexity of the game, but is still present in full, frustrating force and compounded by the actions of each player added to the game. Game board used in my first play through. Bribe – Looks like a dollar bill with a G in the middle. When passing this spot, a player must pay -, when landing on this spot double – is paid. If the player cannot pay the full amount, they pay whatever they have and receive pitchforks. The governor doesn’t have to pay when passing or landing on any one of these spots. Gamble – Looks like a die with a heart, club, and spade on it. When landing here a six sided die is rolled. If a one is rolled, a misfortune occurs. Rolling a two subtracts 50G, while rolling a four or a six will add 50G or 100G to a player’s purse respectively. Rolling a three subtracts a voter and adds a pitchfork, while rolling a five adds two voters. Income – Clearly a money spot. When passing this spot you get money, or G. When you land on it you get double G! Misfortune – Signified by ominous red face. Passing this spot curses the player with a random misfortune. Landing on it allows a player’s opponent to choose one of two misfortunes that will befall the player. Police – Looks like a police sergeant’s hat. When landing here a player must pay – or there is a chance they will be arrested. Risk – When you land on a risk spot, a six sided die is rolled to see if any misfortune is caused to your player. Prior to the die roll, the player is offered the option to buy insurance for 20G. If accepted and a misfortune occurs, it will be directed toward other players instead of the rolling player. Tribune – Looks like a bullhorn. When landing on one of these spots you can address your voters. A six sided die is rolled to determine the effectiveness of your speech. The Astral Plain – Looks like a hot air balloon. When landing here a player may choose to skip one turn to lose two pitchforks and draw their choice of one out of three cards from the deck. The Bank – Signified by a gold G. When landing here a player may spend G based on their + amount to increase + by 10. The Casino – This spot looks like a dart board. Here a player may roll a six sided die to win or lose an amount of money wagered from their purse. 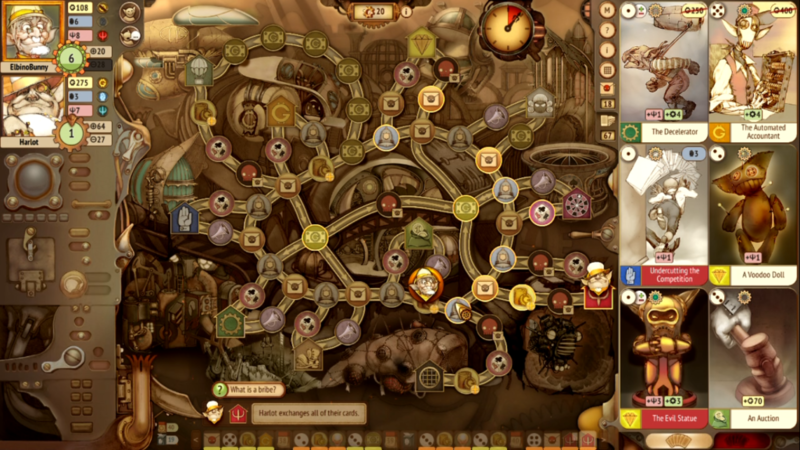 Rolling a 1, 2, or 3 causes the player to lose 100G, 50G or 25G respectively. 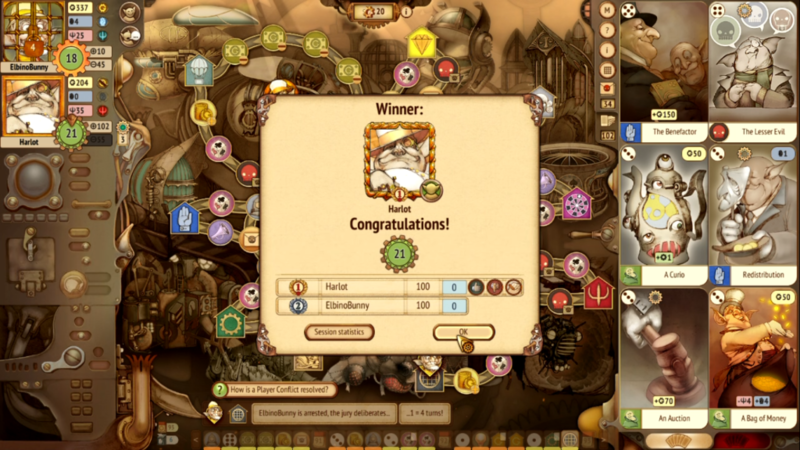 Rolling a 4, 5, or 6 causes the player to gain 25G, 50G, or 100G respectively. The Court – Signified by an icon of an angry looking judge. When landing on this spot a player may pay 40G to take a vote from any player of their choice. The Dump – Looks like a worn out boot. When landing here a player may roll a six sided die to dig through the junk. rolling a 1 causes the player to lose one voter. Rolling a four, five, or six, causes the player to gain 10G, 20G, or 30G respectively. Rolling anything else has no effect. The Jail – Signified by a grid of bars. Many in game actions can send a player to the Jail. Upon entering the Jail, the player rolls a six sided die for the number of turns they will stay in the Jail. At the beginning of each turn spent in the Jail, the player may choose to engage in good behavior, be neutral, or engage in bad behavior. Good behavior helps you get out of the Jail quicker, but bad behavior increases your notoriety and jail experience while potentially adding turns to your sentence. Choosing neutral allows a player to walk the line between the two. The Inferno – Looks like a pitchfork, seems a lot like hell. Appears to be the home of evil. Cards related to the Inferno tend to boost your player’s pitchfork resource number. The Office – Signified by a blue hand. A player may sell 1 voter for 100G on this spot. The Marketplace – Signified by a green moneybag. When landing here a player may sell one of their precious game points for 200G if they wish. The Plant – Signified by a golden gear on a green background. When landing here a player may skip one turn to receive 50G and lose one pitchfork if they so choose. The Treasure – It looks like the game designers attempted to depict a yellow diamond icon for this spot, but I spent my whole first game thinking it looked like a yellow heart. The player may roll a six sided die to see how much treasure, or G, they receive. There is no losing on this space. Rolling a 1 wins 10G, 2 wins 25G, 3 wins 50G, 4 wins 100G, 5 wins 150G, and 6 wins 200G. 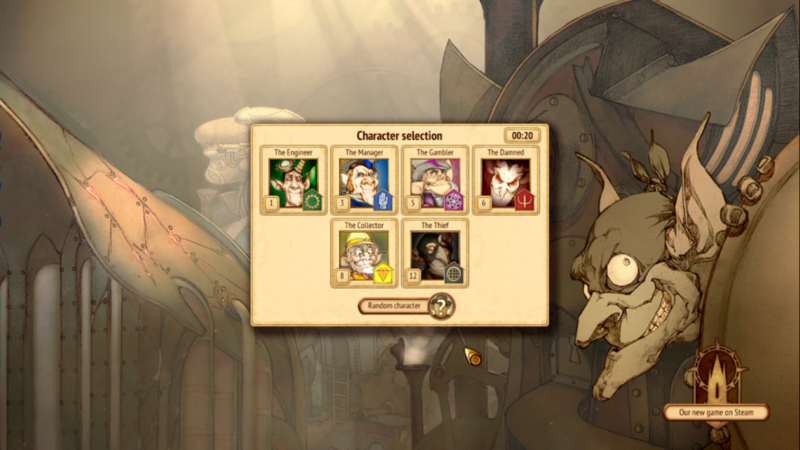 Gremlins, Inc. appears to be more a game of overall strategy as opposed to methodical tactics. Because of all of the probabilities of success and failure on each turn, it makes more sense to come up with a winning method of playing the game that works best in most cases than to tactically plan out each move many moves into the future. A player can plan a general strategy that provides them success a majority of the time and refine their strategy to eliminate those things that cause a loss of resources a plurality of the time. Focusing on the big picture is key. 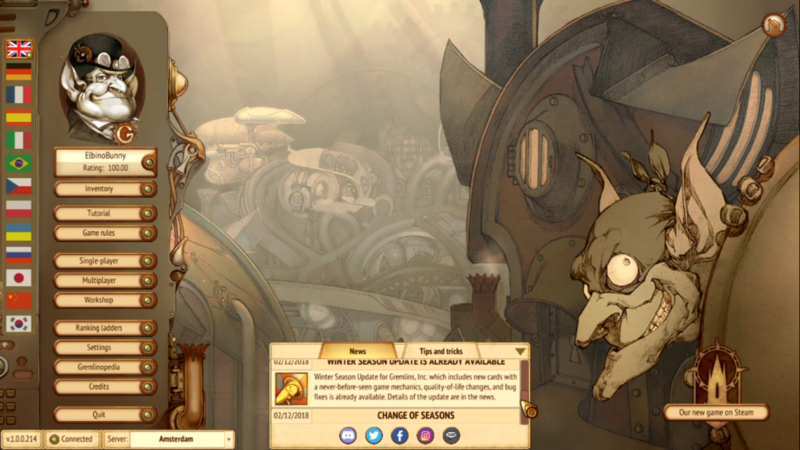 Gremlins, Inc. is a fantastically complex game. It’s the kind of game I always wanted to play as a kid but one I know I would never find anyone who would want to play it with me. If you are not a fan of complex games, don’t let that statement completely scare you away. The computer takes care of most of the complexity, it’s just the player’s job to understand what they want to do and figure out the best path to winning. It’s wonderful that the game designers have created such a game of vast complexity that is relatively simple to play and provides an interface through which to connect to other fans of complex board games worldwide with no real language barrier. I found no evidence of unwholesome material in Gremlins, Inc. There is no violent or sexual content nor bad language that I encountered. It may be a game too advanced for younger children to understand, which could make it frustrating for them to play and for those who play with them. I would say if someone can easily play Magic: The Gathering, they should be able to handily play Gremlins, Inc. I can’t wait to play more Gremlins, Inc. My wife and I both enjoyed our first play through and are eager to play as a team competitively to see how high we can rise on the leader boards. If you are a fan of complex board games, I highly recommend you get this game.